A rewarding partnership with a passionate organization. Thank you for your interest in our forklift certification and training program for veterans, which we offer in partnership with Working Wardrobes, VetNet! This unique collaboration helps veterans gain a new skill so they can seek employment. $99 for standard hands-on forklift training. Offer expires March 15, 2014. 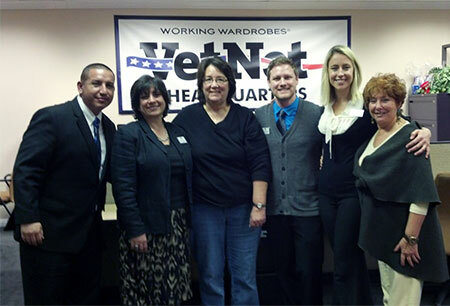 If you're a member of Working Wardrobes, VetNet talk to your counselor about signing up. We look forward to seeing you! On February 2, 2014, A-1 Forklift Certification owner and managing director Donna Fauscette had the honor of touring the Working Wardrobes/VetNet facility. "I was amazed to see the impact that this organization has on the community it serves," she says. "I listened emphatically to the speakers as they talked about how they teach and train individuals who have been less fortunate." Founded by Jerri Rosen, Working Wardrobes/VetNet helps veterans mainstream back into society through coaching, counseling and mentoring. VetNet is a new program of Working Wardrobes, which originally formed in 1990 to offer support to women in shelters. Today, Working Wardrobes "helps 5,000 men, women, veterans and young adults in crises re-enter the workforce each year," reports Working Wardrobes. "I'm so excited about working with the Working Wardrobes/VetNet team," Donna says. "The entire staff is so passionate about what they do." In keeping with the Working Wardrobes mission, VetNet helps to develop and redefine one's self respect and aids in building self-esteem. "The program offers skills assessment, mock interviews, support with resume writing, job placement and, last but not least, a new wardrobe," Donna says. "A-1 Forklift's affiliation with Working Wardrobes/Vet Net is training and certifying our veterans on the safe operation of forklift driving and giving them a skill so they can earn a better living." A-1 Forklift Certification is a total solutions provider of forklift certification and training programs in Los Angeles, Riverside, San Bernardino and Orange counties.